Of course the first thing to do was to make a grand survey of the country she was going to travel through.1 "It's something very like learning geography," thought Alice, as she stood on tiptoe in hopes of being able to see a little further. "Principal rivers  there are none. Principal mountains  I'm on the only one, but I don't think it's got any name. Principal towns  why, what are those creatures, making honey down there? They can't be bees  nobody ever saw bees a mile off, you know " and for some time she stood silent, watching one of them that was bustling about among the flowers, poking its proboscis into them, "just as if it was a regular bee," thought Alice. "I think I'll go down the other way," she said after a pause; "and perhaps I may visit the elephants later on. Besides, I do so want to get into the Third Square!" "Tickets, please!" said the Guard, putting his head in at the window. In a moment everybody was holding out a ticket: they were about the same size as the people, and quite seemed to fill the carriage. "Now then! Show your ticket, child!" the Guard went on, looking angrily at Alice. And a great many voices all said together ("like the chorus of a song,"5 thought Alice), "Don't keep him waiting, child! Why, his time is worth a thousand pounds a minute!" "I'm afraid I haven't got one," Alice said in a frightened tone: "there wasn't a ticket-office where I came from." And again the chorus of voices went on. "There wasn't room for one where she came from. The land there is worth a thousand pounds an inch!" "Don't make excuses," said the Guard: "you should have bought one from the engine-driver. "6 And once more the chorus of voices went on with "The man that drives the engine. Why, the smoke alone is worth a thousand pounds a puff!" Alice thought to herself, "Then there's no use in speaking." The voices didn't join in, this time, as she hadn't spoken, but to her great surprise, they all thought in chorus (I hope you understand what thinking in chorus means  for I must confess that I don't7), "Better say nothing at all. Language is worth a thousand pounds a word!" "I shall dream about a thousand pounds8 to-night, I know I shall!" thought Alice. All this time the Guard was looking at her, first through a telescope, then through a microscope, and then through an opera-glass. At last he said, "You're travelling the wrong way,"9 and shut up the window and went away. "So young a child," said the gentleman sitting opposite to her (he was dressed in white paper10), "ought to know which way she's going, even if she doesn't know her own name!" A Goat, that was sitting next to the gentleman in white, shut his eyes and said in a loud voice, "She ought to know her way to the ticket-office, even if she doesn't know her alphabet!" Alice couldn't see who was sitting beyond the Beetle, but a hoarse voice spoke next. "Change engines " it said, and was obliged to leave off. "It sounds like a horse," Alice thought to herself. And an extremely small voice, close to her ear, said, "You might make a joke on that  something about 'horse' and 'hoarse,' you know." Then a very gentle voice in the distance said, "She must be labelled 'Lass, with care,' you know "
And after that other voices went on ("What a number of people there are in the carriage!" thought Alice), saying, "She must go by post, as she's got a head on her "12 "She must be sent as a message by the telegraph "13 "She must draw the train herself the rest of the way " and so on. But the gentleman dressed in white paper leaned forwards and whispered in her ear, "Never mind what they all say, my dear, but take a return-ticket every time the train stops." "Indeed I shan't14!" Alice said rather impatiently. "I don't belong to this railway journey at all  I was in a wood just now  and I wish I could get back there!" "You might make a joke on that,' said the little voice close to her ear: "something about 'you would if you could,' you know." "Don't tease so," said Alice, looking about in vain to see where the voice came from. "If you're so anxious to have a joke made, why don't you make one yourself?" The little voice sighed deeply. It was very unhappy, evidently, and Alice would have said something pitying to comfort it, "if it would only sigh like other people!" she thought. But this was such a wonderfully small sigh, that she wouldn't have heard it at all, if it hadn't come quite close to her ear. The consequence of this was that it tickled her ear very much, and quite took off her thoughts from the unhappiness of the poor little creature. "I know you are a friend," the little voice went on: "a dear friend, and an old friend. And you won't hurt me, though I am an insect." "What kind of insect?" Alice inquired a little anxiously. What she really wanted to know was, whether it could sting or not, but she thought this wouldn't be quite a civil question to ask. "What, then you don't " the little voice began, when it was drowned by a shrill scream from the engine, and everybody jumped up in alarm, Alice among the rest. The Horse, who had put his head out of the window, quietly drew it in and said, "It's only a brook we have to jump over." Everybody seemed satisfied with this, though Alice felt a little nervous at the idea of trains jumping at all. "However, it'll take us into the Fourth Square, that's some comfort!" she said to herself. In another moment she felt the carriage rise straight up into the air, and in her fright she caught at the thing nearest to her hand, which happened to be the Goat's beard. But the beard seemed to melt away as she touched it, and she found herself sitting quietly under a tree  while the Gnat15 (for that was the insect she had been talking to) was balancing itself on a twig just over her head, and fanning her with its wings. It certainly was a very large Gnat: "about the size of a chicken," Alice thought. Still, she couldn't feel nervous with it, after they had been talking together so long. " then you don't like all insects?" the Gnat went on, as quietly as if nothing had happened. "I like them when they can talk," Alice said. "None of them ever talk, where I come from." "What sort of insects do you rejoice in, where you come from?' the Gnat inquired. "I don't rejoice in insects at all," Alice explained, "because I'm rather afraid of them  at least the large kinds. But I can tell you the names of some of them." "Of course they answer to their names?" the Gnat remarked carelessly. "I never knew them to do it." "What's the use of their having names," the Gnat said, "if they won't answer to them?" "I can't say," the Gnat replied. "Further on, in the wood down there, they've got no names  however, go on with your list of insects: you're wasting time." "Well, there's the Horse-fly17," Alice began, counting off the names on her fingers. "All right," said the Gnat. 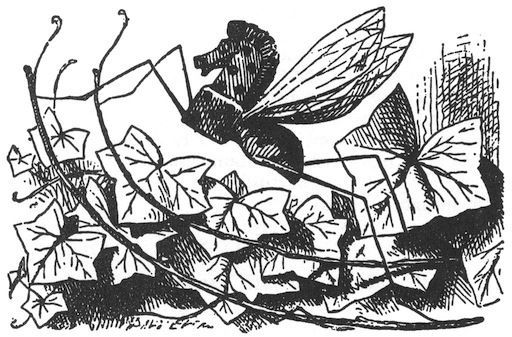 "Half way up that bush, you'll see a Rocking-horse-fly, if you look. It's made entirely of wood, and gets about by swinging itself from branch to branch." "What does it live on?" Alice asked, with great curiosity. "Sap and sawdust," said the Gnat. "Go on with the list." "Look on the branch above your head," said the Gnat, "and there you'll find a Snap-dragon-fly. 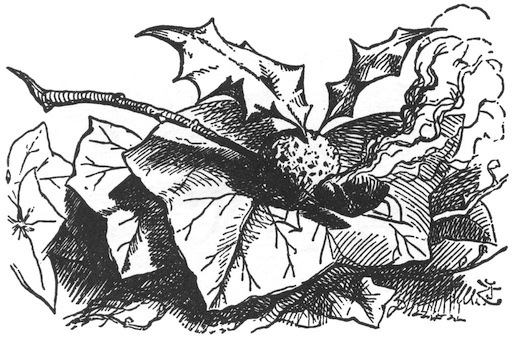 Its body is made of plum-pudding18, its wings of holly-leaves, and its head is a raisin burning in brandy." "Frumenty19 and mince pie," the Gnat replied; "and it makes its nest in a Christmas box20." "And then there's the Butterfly," Alice went on, after she had taken a good look at the insect with its head on fire, and had thought to herself, "I wonder if that's the reason insects are so fond of flying into candles  because they want to turn into Snap-dragon-flies!" A new difficulty came into Alice's head. "Supposing it couldn't find any?" she suggested. "Then it would die, of course." "But that must happen very often," Alice remarked thoughtfully. After this, Alice was silent for a minute or two, pondering. The Gnat amused itself meanwhile by humming round and round her head: at last it settled again and remarked, "I suppose you don't want to lose your name?" "And yet I don't know," the Gnat went on in a careless tone: "only think how convenient it would be if you could manage to go home without it! For instance, if the governess wanted to call you to your lessons, she would call out 'Come here ,' and there she would have to leave off, because there wouldn't be any name for her to call, and of course you wouldn't have to go, you know." "That would never do, I'm sure," said Alice: "the governess would never think of excusing me lessons for that. If she couldn't remember my name, she'd call me 'Miss,' as the servants do." "Well, if she said 'Miss,' and didn't say anything more," the Gnat remarked, "of course you'd miss your lessons. That's a joke. I wish you had made it." "Why do you wish I had made it?" Alice asked. "It's a very bad one." "You shouldn't make jokes," Alice said, "if it makes you so unhappy." She very soon came to an open field, with a wood on the other side of it: it looked much darker than the last wood, and Alice felt a little timid about going into it. However, on second thoughts, she made up her mind to go on: "for I certainly won't go back," she thought to herself, and this was the only way to the Eighth Square. "This must be the wood," she said thoughtfully to herself, "where things have no names. I wonder what'll become of my name when I go in? I shouldn't like to lose it at all  because they'd have to give me another, and it would be almost certain to be an ugly one.22 But then the fun would be trying to find the creature that had got my old name! That's just like the advertisements, you know, when people lose dogs  'answers to the name of "Dash": had on a brass collar'  just fancy calling everything you met 'Alice,' till one of them answered! Only they wouldn't answer at all, if they were wise." She was rambling on in this way when she reached the wood: it looked very cool and shady. "Well, at any rate it's a great comfort," she said as she stepped under the trees, "after being so hot, to get into the  into what?" she went on, rather surprised at not being able to think of the word. "I mean to get under the  under the  under this, you know!" putting her hand on the trunk of the tree. "What does it call itself, I wonder? I do believe it's got no name  why, to be sure it hasn't!" 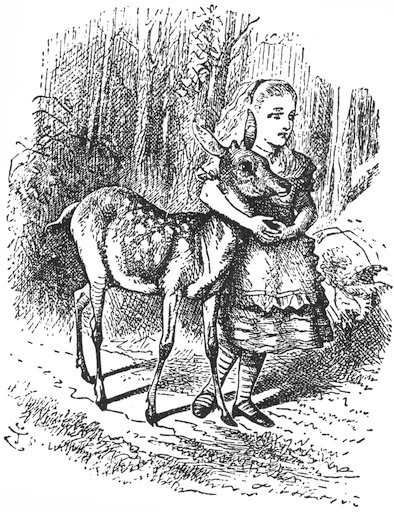 Just then a Fawn came wandering by: it looked at Alice with its large gentle eyes, but didn't seem at all frightened. "Here then! Here then!" Alice said, as she held out her hand and tried to stroke it; but it only started back a little, and then stood looking at her again. "What do you call yourself?" the Fawn said at last. Such a soft sweet voice it had! "I wish I knew!" thought poor Alice. She answered, rather sadly, "Nothing, just now." Alice thought, but nothing came of it. "Please, would you tell me what you call yourself?" she said timidly. "I think that might help a little." "I'll tell you, if you'll move a little further on," the Fawn said. "I can't remember here." So they walked on together though the wood, Alice with her arms clasped lovingly round the soft neck of the Fawn, till they came out into another open field, and here the Fawn gave a sudden bound into the air, and shook itself free from Alice's arms. "I'm a Fawn!" it cried out in a voice of delight, "And, dear me! you're a human child!" A sudden look of alarm came into its beautiful brown eyes, and in another moment it had darted away at full speed. Alice stood looking after it, almost ready to cry with vexation at having lost her dear little fellow-traveller so suddenly. "However, I know my name now." she said, "that's some comfort. Alice  Alice  I won't forget it again. And now, which of these finger-posts ought I to follow, I wonder?" It was not a very difficult question to answer, as there was only one road through the wood, and the two finger-posts both pointed along it. "I'll settle it," Alice said to herself, "when the road divides and they point different ways." The "of course" is not so evident, though making a grand survey is certainly a first step in any colonial venture, and there were still a few of the old-fashioned kind of colonial venture going on at the time that the Alice books were published. This is likely one of the images that leads some to insist that Lewis Carroll was taking drugs when he wrote the Alice books. However, that can only be claimed here if we ignore the inverted logic of the Looking-glass world. In the normal world, bees are small and they engage with flowers no larger most of the time than those Alice was speaking with in the previous chapter. Bumblebees in particular are large relative to other bees and look like they shouldn't be able to fly  in fact scientists are still puzzling over how they manage it. So what then could be a giant animal that doesn't look like it could ever fly with a proboscis to collect nectar with that could be set in place of the bumblebee? From that perspective, an elephant and the accompanying giant flowers make sense. There are several versions of Slavic fairy tales centred on the mysterious Baba Yaga, who lives in a cottage that hops about on chicken legs. It is hard to say what brought this fascinating image to mind for the Slavs! My hard copy edition of Through the Looking Glass does not include the "transition stars" which I have reinstated here. They aren't strictly necessary as each change is heralded by a specific reference to crossing a brook between squares, but this was also true in Wonderland where major changes were heralded by Alice consuming a food or drink to change her size before she could know what the effect of what she consumed would be. This just might be a reference to the musicals of Gilbert and Sullivan, where much of the subsidiary cast on stage would indeed sing choruses all together in counterpoint to the main character. Including, if my memory serves, in response to words spoken as asides and "thoughts"  since of course those "thoughts" must be heard nonetheless by the audience for the humour of the story to work. In my rather peculiar childhood, among the movies and filmed musicals I was obliged to watch was H.M.S. Pinafore, which was one of Gilbert and Sullivan's greatest hits. But could she have done? This hardly seems likely, as the engine-driver was not terribly accessible to passengers as a rule. 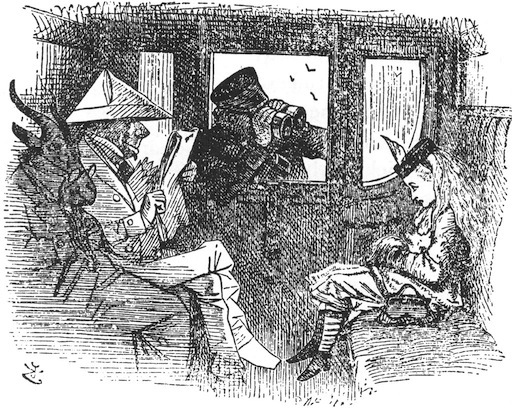 It is quite common to see another railway employee standing by the train door for passengers taking tickets if not selling them in depictions of Victorian era trains in television programs and the like. The featured car seems to always be the engine car, which allows the de rigeur dramatic frame of the train pulling out with a blast of steam and exhaust smoke. Asides to the fourth wall like this are pleasantly rare in both Alice books, and stand as one of the weaknesses of The Hobbit and quite a few other books written for children that have continuing interest for adults. In moderation they are pleasantly avuncular, in excess condescending. So just how much was a thousand pounds worth in Alice's day? According to the Victorian Web, if you were better paid but not rich you could make 200 to 300 pounds a year, if you were a more common sort of labourer about a hundred pounds a year. Those numbers could all be roughly doubled by the early 1900s. According to the same site, cost of living for a single man could be around 150 pounds per year at the start of the Victorian era and up to three times more at the end. Despite the variable cost of living and wage levels over the 1800s to the 1900s then, a thousand pounds was nothing to sniff at. This remarkable claim seems to be related to the Guard's use of a telescope, microscope, and opera-glass in succession. While the first two instruments are fairly familiar, opera-glasses are less so nowadays because they are rarely referred to by this term anymore. They are no more than low-power binoculars which today are often sold alongside equipment geared towards birding or watching high-speed car races from less-expensive seats. What makes opera-glasses different from these, which tend to look like just what they are, mini-binoculars, is their high level of ornamentation. They were originally a sort of fashion-statement in their own right, so they could be clad in all manner of ornate brass, ivory, or wood. Some lighter opera glasses are shown being used in artwork included in fancier editions of books like Phantom of the Opera that are mounted on a handle and held up to the eyes rather like a light eye mask. It's hard to see how this could have been useful, as this would have amplified the natural shake in the arm and hand of the user. This extraordinarily dressed gentleman bears a striking resemblance to the Knave on trial at the end of Alice's Adventures in Wonderland. This is quite interesting, since it is widely accepted that the man in white paper is a caricature of Benjamin Disraeli, the prime minister of the time. Admittedly the resemblance is by no means exact, but they share the weedy moustache and shaded nose suggesting a drinking habit. A "white paper" in the british parliamentary system is typically a research paper written up by staff working for the current government on a given topic, and inflected by the ideological leanings of that government. Many such papers are actually quite innocuous, but they can become political bombshells. Canada has one particular example in its history that is still known as the White Paper because of how infamous its contents, especially its policy suggestions, became. 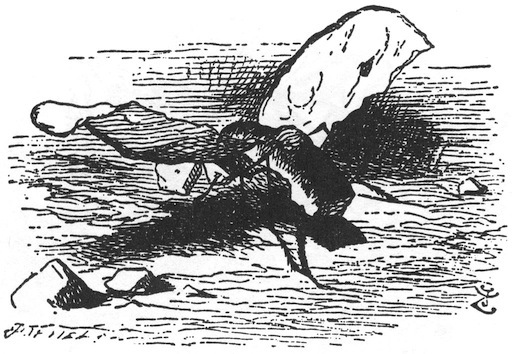 Perhaps Tenniel opted not to illustrate the Beetle for fear of the squeamishness of the adults looking through the book. Alice certainly isn't phased, being more concerned with the Guard. The concerns of adults would in time relegate the original frontispiece of the book, the picture of the warrior facing the bandersnatch to where Humpty Dumpty explains Jabberwocky. This refers to postage stamps, which customarily showed the head of the current monarch and differed in colour by value. (That is, a green stamp might be worth one penny, a red stamp a shilling, for example.) Considerable advances in printing were required before the currently more familiar four colour glossy stamps could be produced. In fact, older stamps have a greater resemblance to money because the images were pure line art. This is an intriguing idea, however facetious the suggestion. Star Trek and the various other science-fiction programs featuring some version of rendering people into energy at one place and then reconstituting them somewhere else has become as much a trope as faster than light travel. It also seems just as impossible for the moment, though it raises all sorts of practical and philosophical questions. For instance, could we be sure that a whole person could be reconstituted? What if it wasn't so easy to reconstitute their consciousness? How could we ethically test that out if we could do it? Supposing it did work, would it really be the same person at the other end? Here is another instance of interesting typographical choices. Depending on the edition you look at, you may see the contraction of "shall not" rendered as "shan't" or "sha'n't" and indeed this is true also of "will not" rendered as "won't" or "wo'n't". Using two apostrophes is entirely logical, as they are supposed to indicate dropped letters. However, there are many more contractions of auxiliary verbs with not that don't drop letters from the first word, with the end result that these two tended to lose their first apostrophe by analogy. Gnats are apparently small biting insects that fill the niche that mosquitoes do in the americas. Accordingly, one of their favourite pastimes would be buzzing incessantly about the ears of any warm blooded creature they hope to bite. Or at least, those that don't prefer to feed on plants, which presumably is the sort of gnat that Alice is dealing with here. This is a gentle dig at the obsessive penchant for cataloguing and naming that is a true hallmark of the Victorian period, though it began earlier. The instigator of the trend is Carolus Linnaeus, or to give his name in its original as opposed to latinized form, Carl von Liné. He created the binomial naming scheme that every student of zoology, botany, biology, and related fields is required to learn. Once a method of labelling was available, explorer-scientists put it to use while on their expeditions. The result was an explosion of labelling and specimen collecting as various european powers engaged in invading and colonizing lands far from the places they knew. Alas, horseflies are anything but pleasant to encounter. They give savage bites that can swell up appallingly and itch worse than mosquito bites. If your fortune is truly evil however, you may be bitten by a type of horsefly that actually takes a small chunk of skin when it bites. If those were the flies that tormented Io in the form of a cow, it's little wonder that she fled across continents in hopes of escaping them. Plum pudding is not like the milk-based puddings that grace shelves in north american grocery stores. It could be considered a variant of bread pudding, in that it consists of a cake that has a flavoured sauce poured over it. In this case, the cake could include bits of plum and the sauce would be plum flavoured itself with overtones of brandy. "Frumenty" is mysterious stuff indeed. According to my electronic OED, it is made of "hulled wheat boiled in milk and seasoned with cinnamon and sugar" which sounds suspiciously like a somewhat fancier porridge. It featured alongside the meat dishes in upper class medieval cuisine (this seems to have been much like the north american version of "chinese" food, full of sweet sauces and side dishes in the main meal). Later as tastes and meal definitions changed, it became more of a desert or perhaps a filling mid-afternoon sort of meal. This is likely the box that gave the name to "Boxing Day." There were several sorts of christmas boxes, including those meant to hold keepsakes and memorabilia. The more publicly noticed christmas boxes were used to package gifts to be given away as acts of charity by the better-off classes. These origins cast an ironic light on the modern version of boxing day. Bread and butter, sugar, cream, and tea constitute the elements of a very basic english tea. The english version of "tea" as a meal was developed by a noblewoman to tide herself over the long gap between lunch and the typically late dinner of her time. This is quite an interesting idea, that on one hand every creature and thing has a name of some kind, but on the other those names can be shuffled arbitrarily. It seems that there are no extra names, which is all very strange until we substitute "numbers" for "names." If we make the substitution it does make more sense, while drawing out some of the strangeness of numbers. For example, there are no extra numbers, yet there is also no finite amount of numbers. In fact there are even different sorts of infinity, as demonstrated by Georg Cantor. Which is quite true of the real Alice, whose last name did indeed start with an "L". Alice's efforts to remember here are based on a commonly used technique of trying to find the first letter of a word or name to be remembered. A curious feature of this approach in my experience is that the letter chosen is so rarely anything close to what the thing to remembered in fact starts with, though it may work in helping remember it all the same. These two characters don't merely derive from a nursery rhyme. Turning first to my trusty electronic OED, it explains that the pair were created in a satire on the composers Bononcini and Handel. The satirist, John Byrom, apparently deemed them "so similar as to be identical." According to Wikipedia, the two composers were rivals in the London musical scene, a rivalry that even became tied into politics as they were favoured by different political parties. Bononcini wound up running himself from the field by plagiarizing another composer's work. In addition, a number of websites offer definitions of "tweedle" as a verb, referring to making piping, musical sounds. This seems plausible given the context of the invention of the names "Tweedledum and Tweedledee."